I'm sure you're all bored of me talking about snails now, but the fact is, they're one of my favourite skincare ingredients. Whilst I've tried many a snail product within Korean/Asian skincare, I've really not played with many from Western brands, leading to me jumping at the chance when Skinchemists offered to let me try their Advanced Snail range. 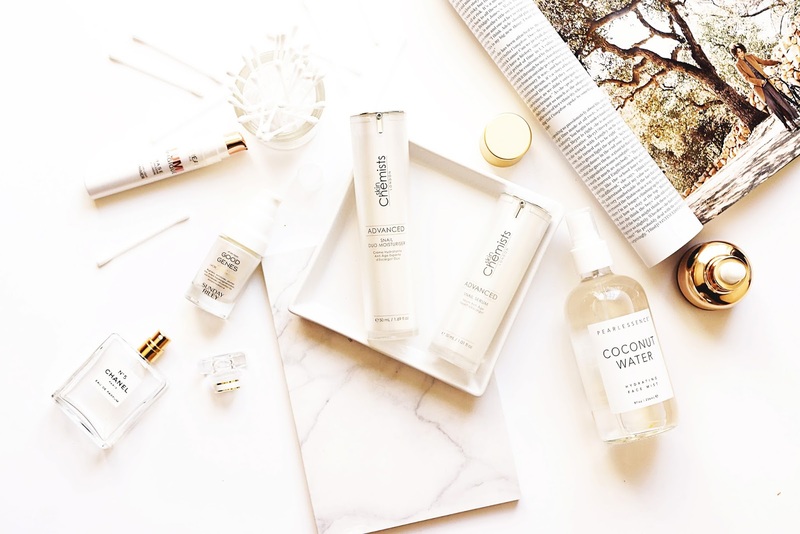 I've only ever seen their brand on the odd occasion when browsing the crowded shelves of TKMaxx but Skinchemists are a London based science-nature-hybrid skincare brand that pride themselves on using plant-derived ingredients and being paraben and cruelty free. 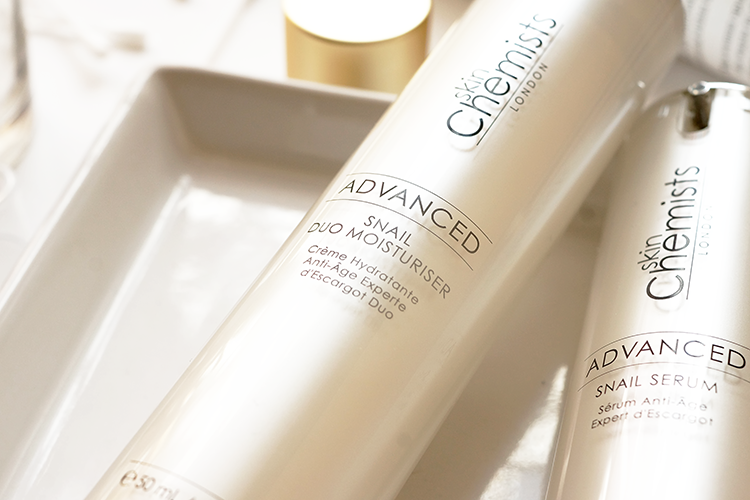 Their Advanced Snail Serum claims to regenerate and fortify skin, whilst boosting hydration levels, whilst the Snail Duo Moisturiser promises to lightly moisturise skin and protect with antioxidants, whilst contributing to anti-aging with peptides. I very much like the aesthetic of both products. The bottle design is light and fresh, chic and simple, and although made of plastic, they look high end. They're nice and sturdy, and both serum and cream are dispensed via pump - keeping the contents fresh and application hygienic. The packaging reminds me of high end Korean skincare (eg Hera), although there's no way of seeing how much product you have left, and no forseeable way of dismantling the bottles to make sure you've used every last drop. 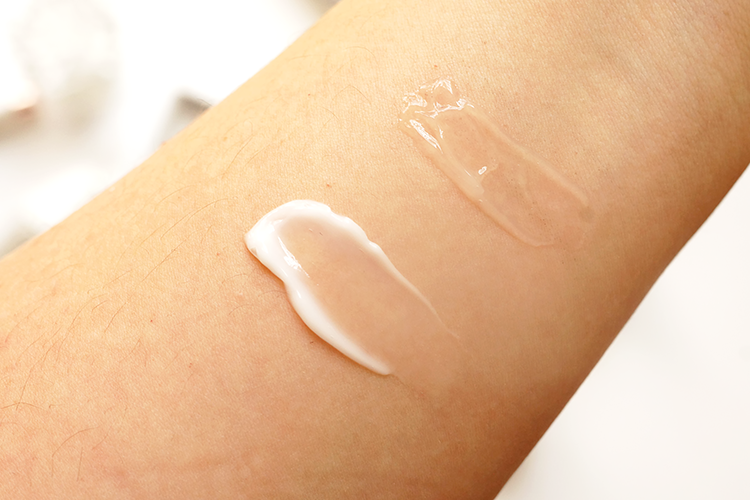 Both products are voluminous and rigid in texture, rather than being fluid, and have a satisfying smear across the skin (the serum is on the right in the above photo). The scent to me is absolutely delicious - somewhere in between apricot and Elemis' Papaya Enzyme Peel, that fades after a few moments, although you'll see later that there are a fair few fragrance ingredients that contribute to that scent, some of which could cause irritation or sensitivity, so make sure you're not allergic to them. I've had no sensitivity or irritation to speak of whatsoever and I'm in love with the scent, it makes the experience of applying these products an absolute pleasure for me, and again, remind me of Korean skincare. Water, Carbomer, Glycerin, Benzyl Alcohol, Allantoin, PEG-7 Glyceryl Cocoate, Phenoxyethanol, Sodium Hydroxide, Polylactic Acid, Disodium EDTA, Snail Secretion Filtrate, Dehydroacetic Acid, Butylene Glycol, Ethylhexylglycerin, Parfum, Aloe Leaf Juice Powder, Ascorbyl Glucoside, Charcoal Powder, Seabuckthorn Fruit Oil, Pumice, Tocopheryl Acetate, Isomalt, Benzyl Salicylate, Glucose, Hexyl Cinnamal, Citronellol, Subtilisin, Hydrolyzed Pearl, Limonene, Pelargonium Graveolens Flower Oil, Shea Butter Seedcake Extract, Geraniol, Linalool, Neroli Flower Oil, Rosa Damascena Flower Oil, Sodium Lactate, Lecithin, Rhodedendron Ferrugineum Leaf Cell Culture Extract, Dipeptide Diaminobutyroyl Benzylamide Diacetate, Polysorbate 20, Sodium Benzoate, Lactic Acid, Palmitoyl Tripeptide-1, Palmitoyl Tetrapeptide-7, CI 17200 (Red 33). Water, Glycerin, Glyceryl Stearate SE, Cetearyl Alcohol, Stearic Acid, Coconut Oil, Isoceteth-20, Polysorbate 20, Phenoxyethanol, Benzyl Alcohol, Carbomer, Polylactic Acid, Disodium EDTA, Ethylhexylglycerin, Snail Secretion Filtrate, Dehydroacetic Acid, Butylene Glycol, Dipeptide Diaminobutyroyl Benzylamide Diacetate, Parfum, Tiare Flower Extract, Aloe Leaf Juice Powder, Ascorbyl Glucoside, Seabuckthorn Fruit Oil, Pumice, Tocopheryl Acetate, Isomalt, Benzyl Salicylate, Glucose, Hexyl Cinnamal, Citronellol, Subtilisin, Hydrolyzed Pearl, Limonene, Pelargonium Graveolens Flower Oil, Shea Butter Seedcake Extract, Geraniol, Linalool, Neroli Flower Oil, Rosa Damascena Flower Oil, Sodium Lactate, Lecithin, Charcoal Powder, Rhodedendron Ferrugineum Leaf Cell Culture Extract, Sodium Benzoate, Lactic Acid, Palmitoyl Tripeptide-1, Palmitoyl Tetrapeptide-7, CI 17200 (Red 33). I was a little confused when it came to ingredients, as I'm sure I've read something about hyaluronic acid but can't see it in the ingredients list? (I took the lists above from the box, someone please correct me if I'm being blind!) The formula has a good number of natural and skin-benefitting extracts, such as pearl to brighten and add luminosity to the skin, sugars to hydrate and hold onto moisture, a mix of peptides for skin fortifying and anti-aging, and of course the snail secretion filtrate to fortify and repair. There are also quite a few fragrances, as mentioned above, preservatives and emulsifiers, so just make sure to check whether you're sensitive to any of these. Something I thought that was interesting is the inclusion of Dipeptide Diaminobutyroyl Benzylamide Diacetate in both products, another name for the anti-aging peptide SYN AKE, which has shown in clinical studies to reduce fine lines and wrinkles. Both products smooth over the skin effortlessly and leave a slight tackiness that sets quickly to a demi-matte finish, especially the moisturiser. 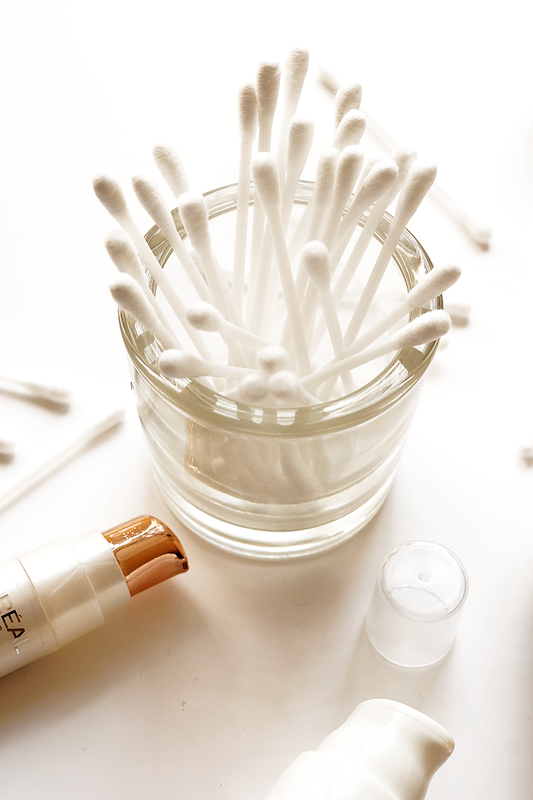 What I love about them is how plump and supple my skin feels after using them, a feeling and appearance which lasts overnight, and I do think my skin feels more firm. The volume I observed on first impressions, translates to volume in the skin once the products have had a moment to sink in. Both the finish and the plumping factor make these a great primer for under makeup, I wear one or the other on my combo skin in the day, and a light layer of both at night, and my skin doesn't feel or look greasy. For dry skins, I'd recommend using both products, possibly with another oil or serum layered underneath, and for very oily skins I'd say these might be too rich for you. My favourite way to use the moisturiser especially is to 'cap' oils at night - which just involves applying this on top of an oil or essence-oil. I love my Banila Co Honey Flower Essence Oil but hate the feeling of oily skin on my pillow, and the mattifying qualities of the Skinchemists Duo Moisturiser is perfect to reduce that, whilst adding yet more hydration. I think it's fairly obvious from my review that I really like these products. I'd only say to be wary of some of the ingredients, and make sure you're not allergic or sensitive to them. I think if you're looking for a concentrated snail product then these won't be for you, and I'd recommend the Cosrx Snail Mucin, which is made of 96% snail. However, if you go in with more of an open mind, I don't think you'll be disappointed. Both products, especially used together, give my skin such volume and bounce - and I thoroughly love that, it's not the easiest to come across in good skincare. Bonus points for getting that volume with a demi-matte finish, I'm almost certain I'll be restocking when they've run out. These items are far from cheap, retailing at around the £70 mark, but Skinchemists have been incredibly generous in giving my followers the code SNAIL16 for a whopping 70% off for a limited time on the serum or duo moisturiser. 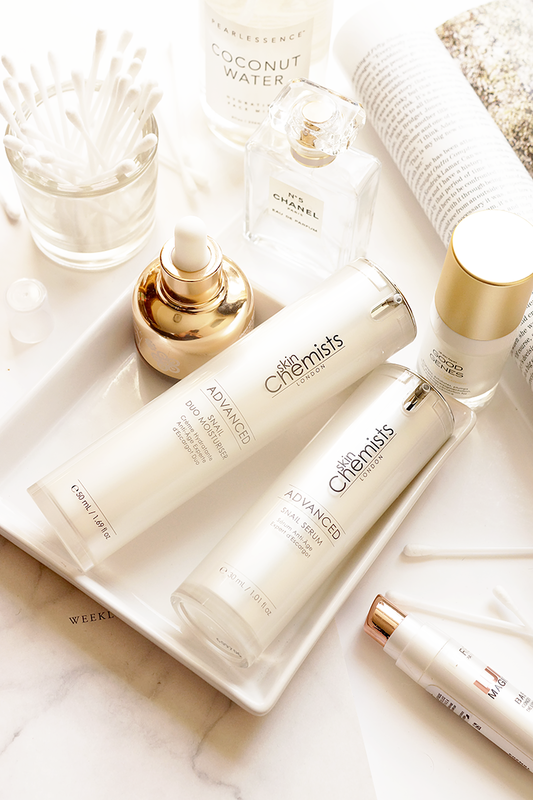 Have you tried anything from Skinchemists? 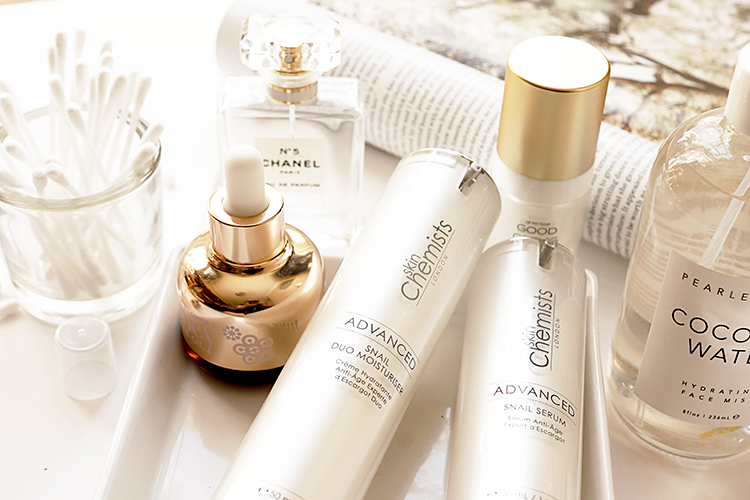 P.S Have you seen my Korean Skincare Dupes For High End Favourites? these products sound interesting! i really want to try out some more products with snail in them as the idea of that ingredient itself really interests me! As always a fabulous and in depth review. Love the sound of the snail serum sounds right up my street. Will definitely be checking these out especially with a super generous discount!! Totally swooning over your photography too lovely.